Posters are one of the most widely used advertising media to promote products, services or something else. To make compelling posters that can achieve an effective result, we have to turn to professionals in the sector: Designers are the ideal people who understand the needs and can turn them into effective visual products. However, not all companies have a budget to order this work from a professional designer. 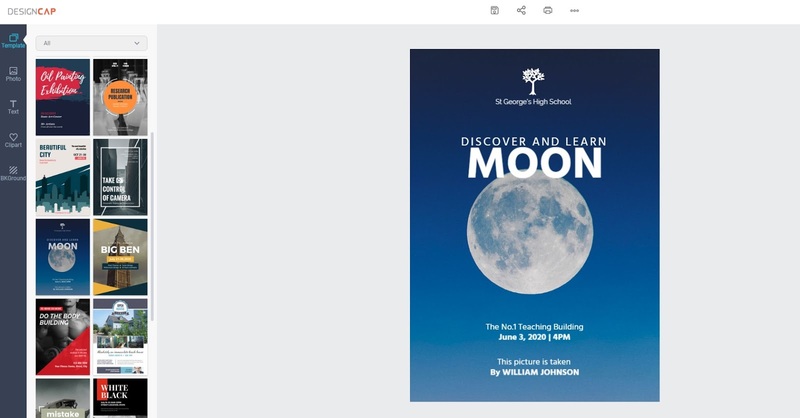 They can use online design tools to create free posters for free. In a wide variety of online design software, if you're looking for a simpler, easier tool to use, DesignCap is definitely the best option. It includes a variety of templates that you can choose from and a number of functions which are ready to go. I think it is one of the most intuitive tools on the Internet. You don't need to register or log in at all, and you can start your creation directly. How to make an awesome poster with DesignCap? To start making posters, you can enter DesignCap into its home page, and then click the Making button. You will see a long list of material templates from the template options on the left-side toolbar, and then you can slowly browse and select the template you want to use. It has provided hundreds of well-designed templates which includes vintage posters, movie posters, birthday posters, etc. After you select a template, you are free to drag its template layout, delete or add elements, change fonts, and upload any pictures on your computer. You can use the free tools it offers to customize the design and retrofit your poster. Once you've reached the final effect, you can just click on the download button above and share it on your Facebook, and you'll be able to store a copy of it on your computer for printing and sharing. 1. Text and picture content should not be too much. Remember, the simpler, the better. 2. The theme font should be striking. It is essential to select a readable font to highlight its interest and attraction. 3. To form a clear hierarchy, you should put the pic be the central part and add some words to express your ideas. 4. Care about colors. It is better to use contrasting colors, large areas of blanks. The concise visual processes make poster be a visual focus. 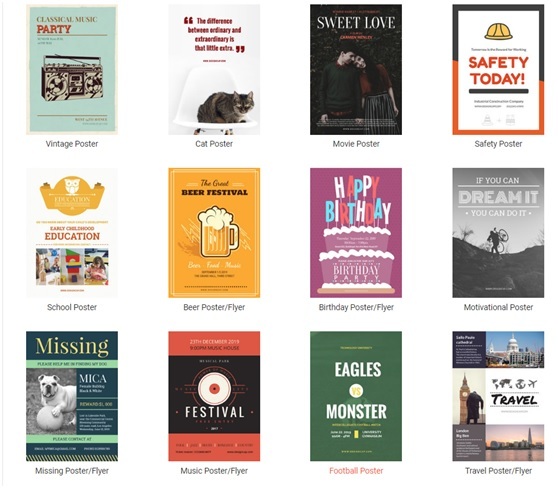 DesignCap is a free online editor that allows you to design various types of posters and flyers that you can use with its simple and intuitive tool to upload images, insert fabulous fonts, frames and changes background colors. It stands out for having a large collection of backgrounds and colors. Any user can become a creative designer by using this tool. Once the whole process is complete, you can download it in JPG or PNG format and share it with your social networks. It is not necessary to install any program to create a flyer. I just made a free flyer by using it. Thanks.